Review: Issian Seattle | Does it come with bacon? 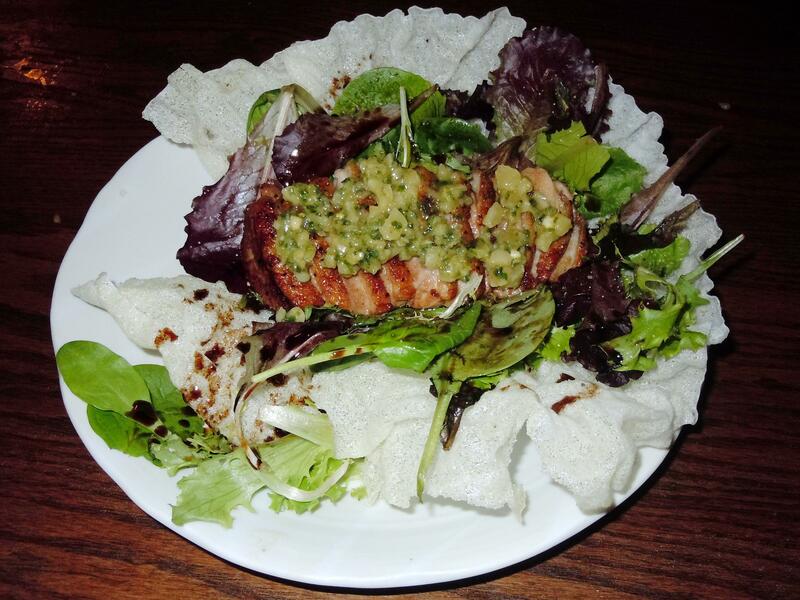 I figured I’d kick things off with a review of my favorite restaurant in Seattle, Issian. But this time, we made it to happy hour and stayed until close (9pm!). And before I begin, my apologies for the length! To be fair, we were there for 3 hours. It reminded me of going out to dinner in Seoul, no rushing just enjoying eating and the company of good friends. First, I’ve got to say that their happy hour is a great deal. It runs everyday from 4:30pm to 6:30pm, with both food and drink specials. The highlights are the $1 yakiton (kurobuta/black pig pork belly) and yakitori (chicken thigh) kushiyaki (skewers)! For that alone, it’s worth it. But then you’ve got 9 other happy hour food items ranging from $2-4 to round out the HH food menu. The drink menu will keep you going as well; with draft beer (including Sapporo), house red/white wine, and small house sake all only $2.80 each (large sake is $4.50). All bottled sake is half off, but that’s a story for another day! We started ordering off the Happy Hour menu. 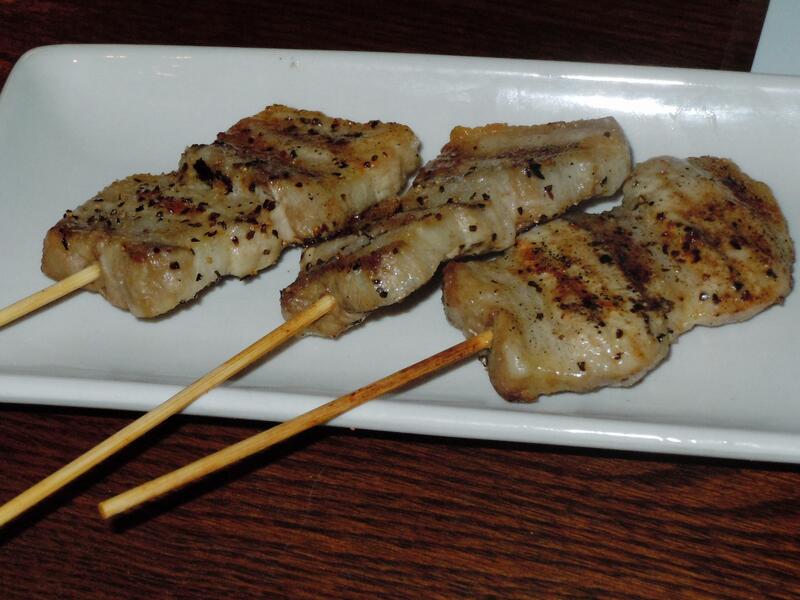 The yakiton kushiyaki was a must, but we tried out the yakitori as well. Just a touch of black pepper and salt on the yakiton is all that’s needed to really bring out the awesome, rich, melt-in-your mouth flavor of the pork belly. And just a little tidbit, kurobuta/black/Berkshire pigs are much more delicious than their pink counterparts! 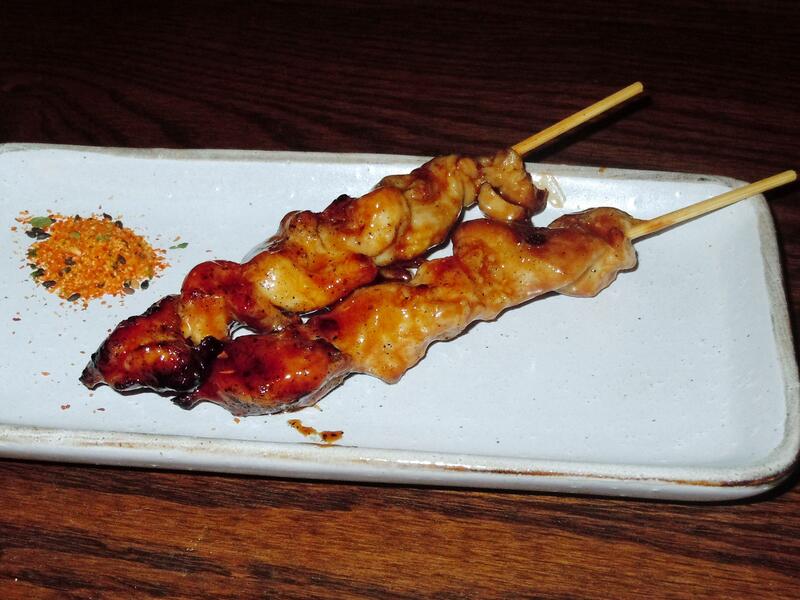 The yakitori had a sweet glaze that wasn’t too sweet or overpowering, but highlighted the dark chicken thigh meat. 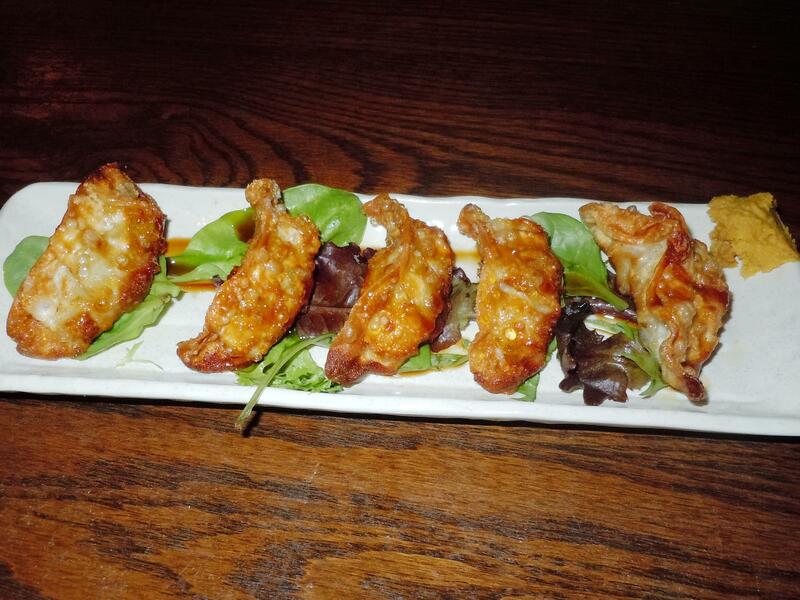 We also gave the gyoza a whirl. While it wasn’t mind-blowing, the balance of pork and ginger flavors was quite good and the crunchy wrapper was cooked just right. 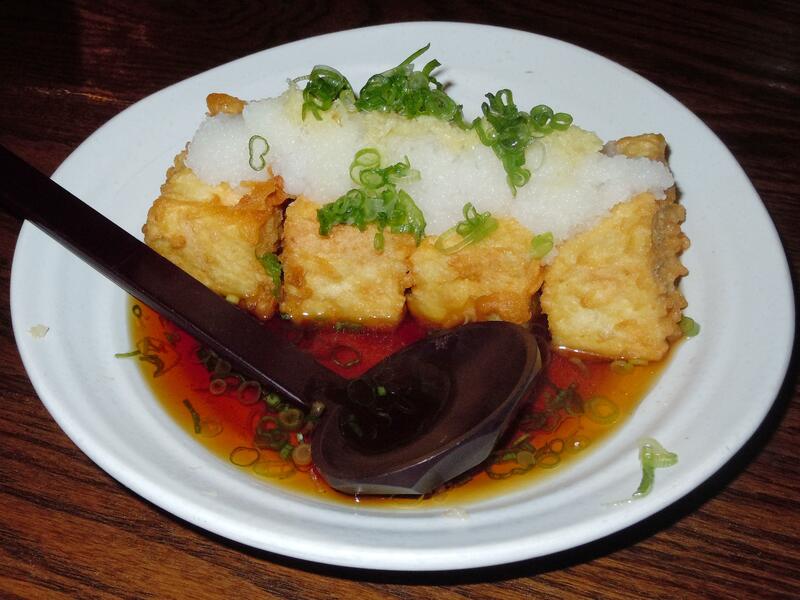 The agedashi tofu, however, was quite delicious. My boyfriend is not always a fan of tofu, but he really enjoyed this dish as the texture of the tofu was ‘firm enough’ for him. The tentsuyu broth was very good, and the tofu was fried to a perfect consistency! We’d gone out with 2 friends of ours who enjoy Issian as much as we do, so we had to get the JFC (Japanese Fried Chicken, aka karaage). 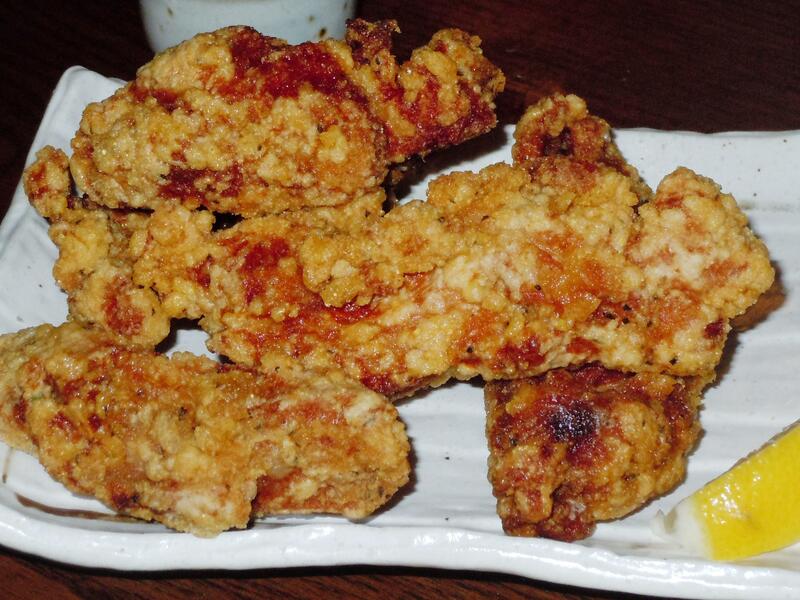 The boneless lightly marinated chicken coated gently in flour is a must-have (along with those pork belly skewers). It’s hard not to order it every time! Our friends left at this point in the meal. My boyfriend and I were still a bit hungry, so we decided to continue on. To be fair, I’d been to Issian a fair amount of times in the past few months while he had not. He was making up for lost time. We dove right in, ordering the half omakase sashimi plate (2 slices each of 4 different fish of the chef’s choosing). For the price and the quality, I’ve not found a better place that Issian for sashimi. 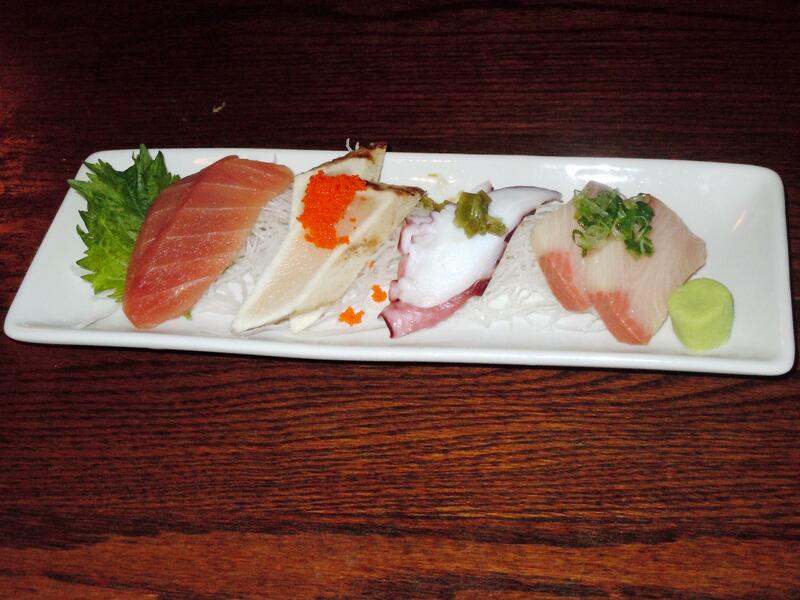 This time around, we were served (from left to right) yellowfin, seared albacore, octopus, and yellowtail. Each fish had great flavor and texture; and while I don’t always enjoy octopus, the octopus at Issian was cooked just enough (not too tough) and had incredible flavor. 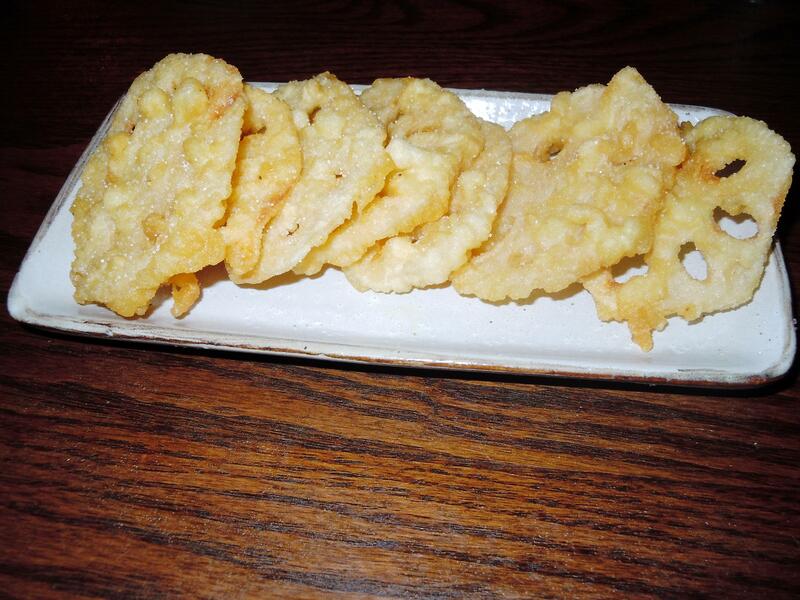 While we were waiting for our sashimi to come out, the server brought us some tempura lotus root – a first for me. I’m not usually a fan of lotus root (often has a weird flavor and texture, in my opinion), but I did enjoy it tempura style! And since it’d been so long, we went all out. We finished the meal ordering scallop sashimi, duck no robata yaki, and yaki onigiri. The scallop sashimi took a while to come out, so the server brought us a seaweed salad, apologizing for the wait. 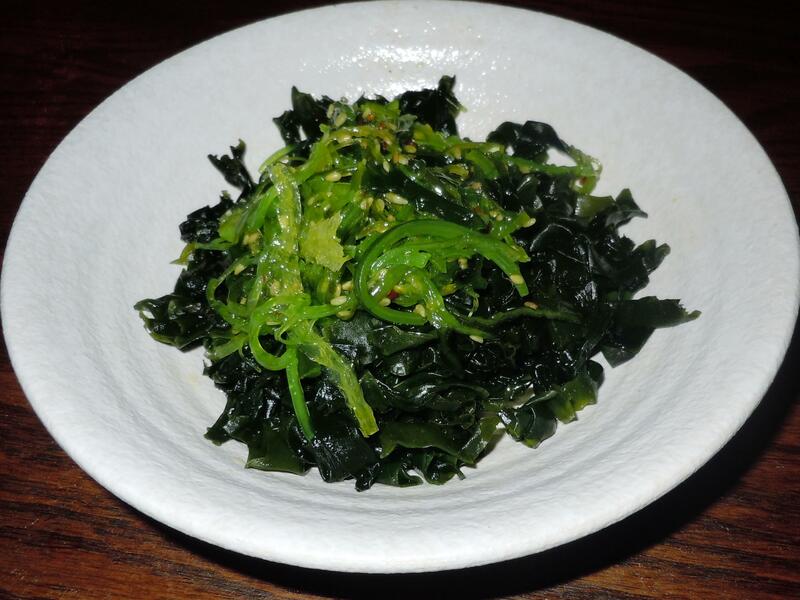 The seaweed salad at Issian is more ‘Korean style’, with a sesame dressing as opposed to the ‘Japanese style’, which has more of a vinegar dressing. That being the case, it was delicious as I’m not too crazy about the Japanese style seaweed salad. The scallop sashimi was worth the wait. It was extremely fresh and incredibly sweet. Issian is the first place I’d tried scallop sashimi (on my first visit), and if it’s on the fresh fish menu, I can’t resist ordering it! 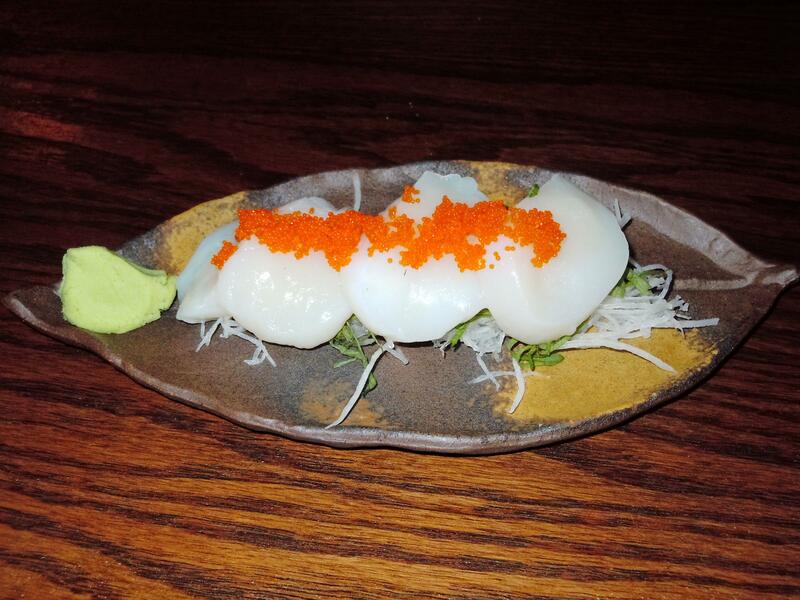 If you are a sashimi fan, then I highly suggest giving the scallop sashimi a try. A little while after, the yaki onigiri (grilled rice ball) came out. This is another must-have in my book. So simple, but so delicious. Just a forewarning, it takes about 10-20 minutes to cook, so order it earlier rather than later. For me, it’s a perfect item toward the end of the meal. 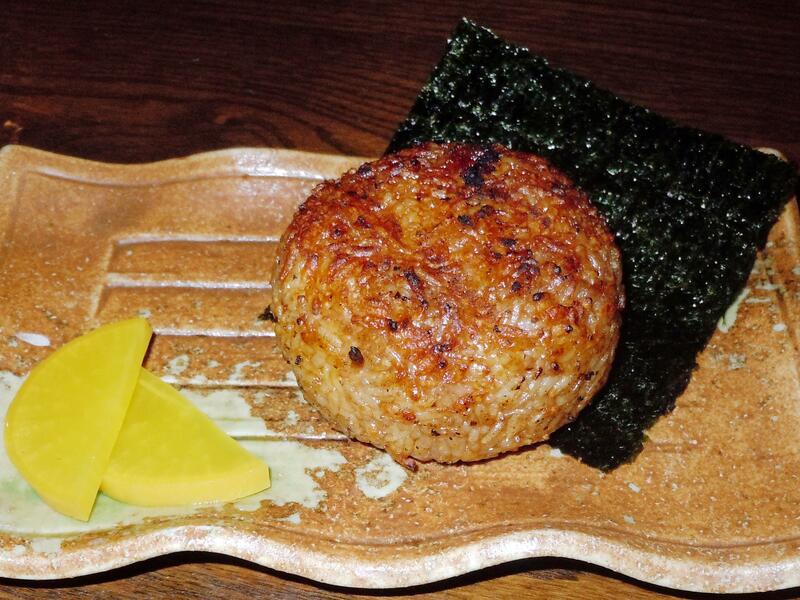 The rice ball is grilled on a wire rack, and the soy sauce brushed on the outside caramelizes as it cooks! And to end things, we had the duck no robata yaki. This is probably one of my favorite duck dishes and one of my very favorite items on the Issian menu. Perfectly seared, sliced duck breast with the most amazing green onion sauce (green onion, boiled peanuts, and garlic) is placed atop a bed of mixed greens and balsamic vinegar. The juice from the duck mixes with the balsamic vinegar to form an awesome ‘dressing’ for the greens. The greens sit upon a puffed up rice cake, akin to the saifun noodles you find in Mongolian beef. And for $9.50, it’s a steal! Throughout the meal, we had a few large sakes. This is one of the few places where the house hot sake is quite good and doesn’t make you want to reach for a drink of water after each sip! And you get to choose your own sake cup, which is a fun plus. To sum it up: Issian is a great place to enjoy an affordable meal of delicious sashimi/sushi, authentic casual Japanese cuisine, and sake. Go during happy hour to get even more bang for your buck! And since we didn’t have room for the Maguro no Kama (tuna collar) this time, you can bet I’ll be back with another review of Issian. Check them out on Yelp and Facebook! This entry was posted in Happy Hour, Reviews. Bookmark the permalink. mmmm never been, but now I must! Must go back for the JFC!